KHAPALBHATI is an exhibition in several parts by Karl Holmqvist. 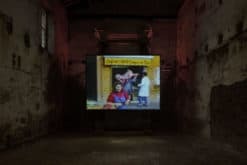 The exhibition consists of three works: a wallpaper covering the façade of the historic building, a video, projected onto a stage (also to be viewed from the former church’s mezzanine), and a large-scale neon text piece. Working across a variety of media, Karl Holmqvist revels in language’s fundamental instability, uncovering its layers of meaning. Building on the traditions of found and concrete poetry, the artist mines pre-existing, commonplace phrases—overheard speech, song lyrics, familiar idioms and axioms—to reconsider their communicative potential. KHAPALBHATI, the show’s title, is a yogic breathing technique and cleansing practice that echoes to the spirituality of Holmqvist’s artistry; his work strips away superficial signification and delves into language’s more nebulous, mysterious essence. The new video, #FLU$$CH, plays with the multiple meanings of the word “flush,” which could indicate a display of embarrassment (flush in the face), wealth (flush with money), or the removal of something—or someone—from your system (to flush out of your body, or down the drain). Words and phrases recur throughout the 29-minute film, both as image and sound. This onslaught of language serves as a kind of reverse-brainwashing: the artist’s rhythmic repetition of found language, sampled from current media and pop culture, collapses and upends the phrases’ original intended meanings. 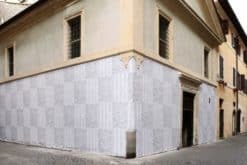 The wallpaper, which covers the historic building’s exterior, consists of poster-style printouts of the video’s texts, both the voiceover and the printed language. In pushing the exhibition to the street level, Karl Holmqvist confounds the relationships between spoken and written word, and the boundaries separating public and private language. The gesture, while visually assertive and formally provocative, is familial and tender: Karl Holmqvist performs intimacy on a grand scale. Finally, the neon, Untitled (CARELESS WHISPER), quotes the eponymous 1984 mega-hit that launched George Michael’s solo career, reading “GUILTY FEET HAVE GOT NO RHYTHM.” The entendre of this famous song lyric is manifest in the song’s original music video, in which the late gay pop star is “guilty” of performing a heterosexual public persona. In huge, glowing letters and installed at the former church’s altarpiece, the word “guilty” carries a particularly potent resonance—although Holmqvist’s guilt is a far cry from the traditional Catholic variety. During the exhibition period there will be a performance event. Details to come. Karl Holmqvist (b. 1964, Västerås, Sweden) lives and works in Berlin. He studied Literature and Linguistics at Stockholm University, Stockholm. Recent exhibitions include: #FLU$$CH, Stockholm Konst, Stockholm (2017); LAVORO (with Klara Liden), Indipendenza, Rome (2017); From Concrete to Liquid to Spoken Worlds to the Word, Centre d’Art Contemporain, Geneva (2017); TUFF LOVE, The Power Station, Dallas (2016); READ DEAR, Camden Arts Centre, London (2016); HURRY UP, CHASE IT DOWN, Sismografo, Porto (2015); Give Posters A Try, Charlottenburg, Copenhagen (2013); Give Poetry A Try, Moderna Museet, Stockholm (2013). 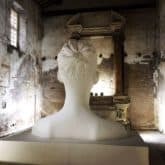 Holmqvist participated in the 2003 and 2011 Venice Biennial. His work has been shown at the Museum of Modern Art in New York (Ecstatic Alphabets/Heaps of Language, 2012), the Performa Performance Art Biennial, New York (2005, 2007 and 2013) and at The Serpentine Gallery, London (2008, 2009 and 2016).